MORETOWN, VT — Junior forward Mia Cooper, daughter of Aaron Cooper of Delphos and granddaughter of Kathy and Rich Cooper of Van Wert, has been named one of the top high school basketball players in the Capital League of Vermont and one of the best underclassmen in Vermont. Cooper was an easy choice for Capital League First Team, which is selected by the league’s coaches. As the focal point of the team’s offense, she was a double-double machine for Harwood High School in Moretown, Vermont, piling up double figures for both points and rebounds in nine games and averaging a double-double for the season, with just over 12 points and 10 rebounds per game. In several games, she approached or cracked the 15-point, 15-rebound mark. 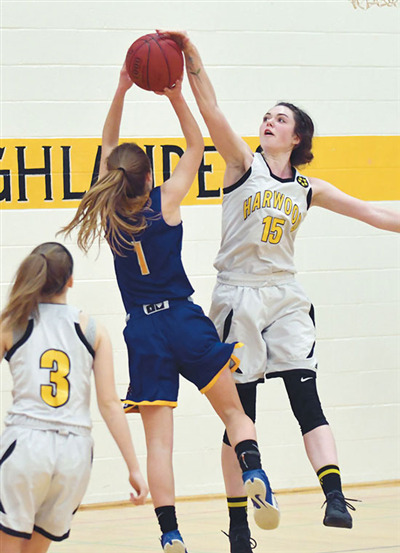 Cooper was also dominant in Harwood’s first playoff win in over a decade, as she turned in a 15-point, 22-rebound night against Lamoille in the opening round of the Division 2 tournament. Mia’s plans are to continue to play basketball and volleyball her senior year and hopes to return to her homestate of Ohio to play college basketball.